Industry leaders like Teresa Torres and Jared Spool have also written about it quite a bit. There’s even an entire book about it by C.Todd Lombardo and Bruce McCarthy! And yet every few months, there’s a flurry of tweets as product managers come together to trash talk roadmaps! You’ll see tweets covering how they’re useless and how they should never be used again… and so the poor roadmap gets a bad rep again. Here’s the thing though, it’s not that roadmaps are useless, it’s that the idea that roadmaps should be date driven that makes them useless – by continuing to use dates we as product managers are perpetuating the problem. So let’s try to nail this once and for all. There are two parts to product development: strategy and execution. The key to a successful product roadmap is to focus on the strategy of the future of your product, rather than how fast you will be building features. Once you have planned what objectives will drive your vision and the problems you will solve, you can then map out how that strategy will work out in the short and long term. A timeline will not reflect that, at least not accurately. This is because deadlines are too prescriptive. Being locked into deliverables at the strategy phase means you are less flexible and adaptable to change, making it harder to pivot your roadmap. As you can see, the image above doesn’t have a timeline or a set release date. It’s not meant to. Your current work will take the amount of time it takes, and considering all the external factors that come into play for something to be delivered – from team growth to customer feedback – those expected release dates will shift. This is where another little handy document comes into play: your release plan. 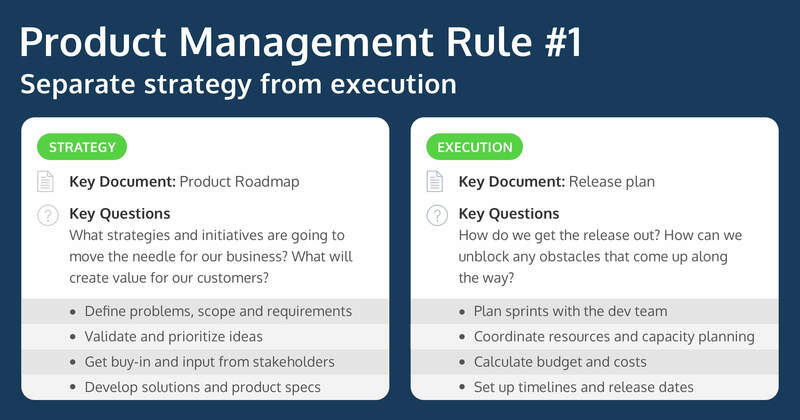 This should include dates (sprints, release dates) to help ensure your team has the right workload so that you’re achieving those objectives you set in your product roadmap. The big question is, why can’t you just use one document? But leadership wants a date driven roadmap! Leadership will always want to see release dates, it’s natural. You should show them your release plan, but you should show them your strategy first. If you go in all timelines blazing you’ve rushed to the end of a conversation before it’s started. What your leadership team doesn’t understand is the scope of the work, leaving them with release dates to go on. It’s a double-edged sword. What objectives are you reaching for? Are your hypotheses being tested? What are the results of these hypotheses, and is your roadmap pivoting because of the outcome? These big picture questions can’t be answered with features laid out on a timeline. It’s a little bit like telling someone you’re going from point A to point B in two weeks with no additional details. If that’s all you’re telling them, they’ll probably imagine you’ll take the quickest and easiest route, like flying first class with full lounge treatment. In reality, the journey is going to be affected by different factors. Reframe the conversation to explain that to get from point A to point B there will be certain factors to consider along the way, such as weather changes, gas refills, bathroom breaks, switching from a camel to a motorbike because that didn’t work out as you planned etc., This level of transparency helps your team become a bit more understanding when things come up and your estimated delivery dates are off slightly delayed. Remember – just because something has always been done a certain way, it doesn’t mean it’s the right way. There is always room for innovation and improvement. Agile shook the waterfall world, it’s time for product roadmaps to be relaunched. Great post. I particularly like you’re not going down the path of the “fluffy” (my words 🙂 ) roadmap that has no timeline, but that you present both the strategy and the execution together. Just one after the other rather than at the same time.